Though stretch marks are usually associated with pregnant women, the truth is that whether you’re a woman or a man, stretch marks can appear on your body in a variety of places, for a variety of reasons. Generally speaking, stretch marks are the result of quick stretching of the skin that causes breakage of the collagen and elastin fibers. Additionally, the epidermis, or outer layer of your skin, is stretched to a translucent thinness that allows the raised, reddish damage of the dermis to show through. 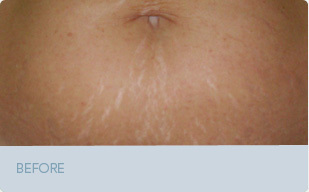 The scar that forms once both the dermis and epidermis have healed is the resulting stretch mark. Stretch marks can affect the upper arms and shoulders, abdomen, breasts, thighs, or buttocks, and tend to be more noticeable the later in your life they are formed. We offer an FDA-approved treatment for stretch marks called Fractional Skin Resurfacing, using the Palomar® Lux 1540 fractional non-ablative skin resurfacing laser. The laser improves the unsightly color and skin texture associated with stretch marks, while minimizing the appearance of stretch marks, for smoother, better-looking skin with no downtime. How does the Lux1540 handpiece work? The Lux1540 handpiece delivers an array of high-precision microbeams to create deep, narrow columns of coagulation in the epidermis and dermis. This triggers a restorative natural healing process that creates healthy new tissue, including the deposition of new collagen. Patients enjoy the benefits of noticeable improvement to skin tone and texture, without the need of any downtime.